Dog Socialising Classes will commence - The Classes are Funded by Local Councillors for the South Westminster Ward including The Churchill Gardens Estate. 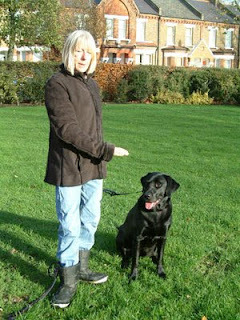 The First session will include walking to heel on the lead, to address pulling, jumping up and barking at other dogs! Also WHY You should pick up after your dog - Health and Environmental Issues. There are four (pilot) sessions; - Saturday 20th November, Tuesday 23rd November, Tuesday 30th November and 4th December 2010. Labels: "dog socialising classes" "South Westminster Ward" "Churchill Gardens" "Dog Breeds" "Dogs on Leads" "Health and Environmental Issues"
D Dinny went missing fromCaher-Civeen on Sunday Dinny is a 5 year old nuetered male - very playful and friendly. 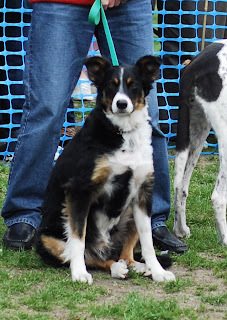 Dinny is microchipped to M. T. Lynn in United Kingdom. An Advertisement regarding his dissappearance has been put on Kerry Radio. A Reward has been offered for his return!.If spotted or found please contact local rescue or vet or Kerry Radio in Ireland. Latest News Dinny Was found Safe - Slightly Injured on Saturday 2nd October 2010. Great News. Dinny was found 80 miles away from his residence in Ireland. His Owners were overjoyed and had praise for the people that found him and took him to the rescue where he was treated for a small injury. Dinny had quite a FAN FOLLOWING on twitter and we hope he will start his own DINNY TWITTER page when he comes back to UK! Angel has been rescued from the streets of Egypt. She had a very bad time living on the streets and was only rescued after being found badly injured. She had been run over by a truck and left to die. Everything is now in place for her journey to the UK for Adoption. 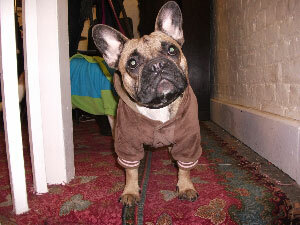 Mable the Thai Dog in London! I met an amazing lady called Niz Khan at the Bike Ride on Saturday the 4th September. 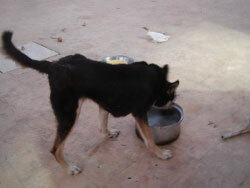 Niz had volunteered at a rescue in Thailand a sanctuary for stray dogs. She fell in love with Mable and brought her back to the UK! Gemma who has been running the sanctuary for five years dedicates her time to helping the stray dogs of Thailand! Any Donations go towards medical care, upkeep and rehoming in the UK. 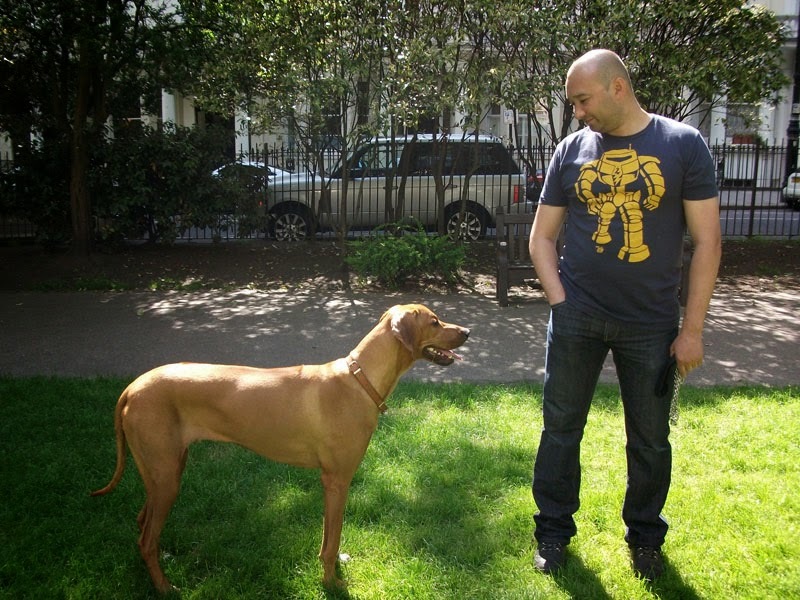 As A Dog Lover and Dog Trainer I can only say that Gemma and Niz are so inspirational. I have offered any help with training or rehabilitation for when the Dogs come to the UK. 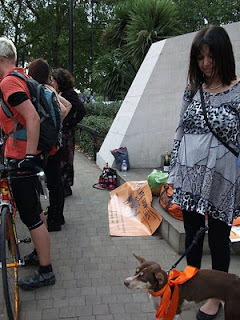 Amazing Day Saturday 4th September - Went to meet some real dog lovers at Hyde Park. It was to support the Canine Life Support International Bike Ride. With Passion and Enthusiasm the Bikers cycled from Europe to the UK. We were there to greet them and spur them on with champagne and balloons. 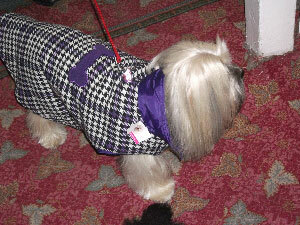 Georgie Hymas a Dedicated Campaigner organised the day - and I was lucky as a Dog Lover to be invited. Met a rescued dog from Thailand - rescued only a few days before. That is another story and will be in my next Blog! Just letting you all know how my 'Dog Show' went - The Sun was shining - Everybody was well behaved - and the owners were too! Silas the Bassett Hound won Best Socialised Dog Best Vetran was Bull Breed Khan and Judy the Whippet were joint winners - Ms Diva was Snoopy a terrier and 2nd Emma a Jack Russell Mr. Slick (handsomest male) was won by Reg a Bull mastiff and 2nd was an old English Collie called Rufty Tuff. Best Rescue was Tyson (a yorkshire terrier) and 2nd was a staffi/x called BB. I LUV MY STAFFI was won by A silver Staffordshire Bull Terrier called Terror - What a Beauty and 2nd was Rocky another sweetheart! Last but not least PUP IDOL was won by Frankie a EnglishBull Terrier pup and 2nd was LULU a stunning Jack Russell and SHADOW an adorable husky - all delighful pups!! Great Day - and the Best thing was how all breeds Big and Small socialised together in Harmony. Dogs can teach us so much about how to live together in an ideal world. 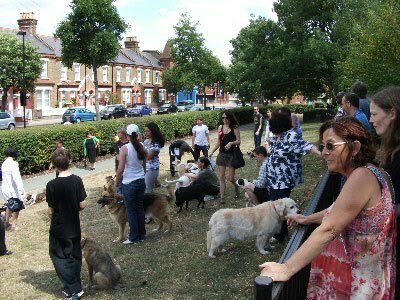 Don't forget 'Scruffs Dog Show' is on this Saturday at Queens Park Gardens, Ilbert Street W10. Registration at 1.30 pm and the Dog Show will commence at 2pm. New category this year is 'I love my Staffie'! Rosettes and prizes for the winners! come along and enjoy! 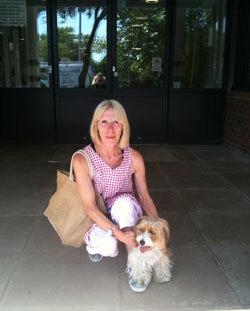 Here I am with a dog called Blossom from a local rescue home in West London. We have just visited a day care centre for the elderly where Blossom was making everyone smile. Blossom is a 'pet therapy' dog. Pet therapy is good for the elderly as it is a way to relieve stress and conditions that cause the elderly discomfort. Hi all you 'badly behaving dogs' and your exasperated owners!!! There is a free competition open to all dog owners living in westminster (http://www.westminster.gov.uk/ ) First prize is a two hour one to one training with your dog (worth £60) Second and Third Prize of one hour one to one training!! To enter - in no more than 30 words WHY YOUR DOG NEEDS TRAINING and send an email or postcard to reporter@westminster.gov.uk or post to Dog Competition, The Reporter, Communications Unit, 17th Floor, Westminster City Hall, 64 Victoria Street, SW1E 6QP. Deadline is Monday 21st June. Have you ever wanted to give back to an animal charity well SATURDAY 15th May 2010 you can and get some free training advice at the same time! between 1pm and 4pm (Tea and biscuits in our secluded garden) and Dog Training Advice given Free. So Come along - it will be a Doggy Fun Day and its a chance to give back to less fortunate animals! !